White Apples, Jonathan Carroll, Tor Books, 2002, ISBN 9780765303882, 304pp. White Apples is the beginning of a new trilogy from Carroll, and with new beginnings he’s decided to modify his modus operandi from previous novels. To start with, gone is the first-person, unreliable male narrator; in its place is a third-person omniscient voice that is both strangly familiar and disconcerting. I hesitate to call it Carroll’s true voice, because he’s shown in previous novels that he can take on differing personas convincingly, and the voice is still filtered here through the impressions of the characters. However, instead of only getting into the thoughts of the primary character lost in Carroll’s latest version of Wonderland, this time you get to understand the motivations of three: the male lead, Vincent Ettrich, “a genial philanderer” (as the dust jacket copy labels him); Isabelle, his true love; and Coco Hallis, his guardian angel. That’s the other thing that’s different about this new novel. Most of Carroll’s novels have something strange and weird about them–the common way I introduce his work to people is to say that it would be labeled magic realism if his last name had been of the Spanish origin. 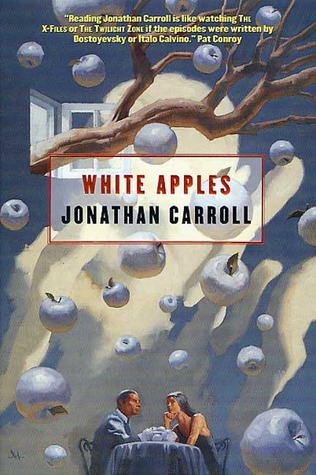 Before White Apples, however, the typical Carroll started off in a world much like our own and only started to look weird halfway through the book when the dog sleeping on the bed starts talking or two characters realize that they share the same dreamworld. In this new novel, Carroll drops us down the rabbit hole in the first chapter when we learn that Vincent is actually dead. Or has died, and now is back, but not in the sense that he was legally dead and the paramedics restarted his heart, but in the Monty Python sense of he had kicked the bucket and was pushing up daisies, and now he’s walking his old haunts. No one knows the difference, except for his friend Bruno Mann, but that’s because Bruno’s dead himself. It only gets weirder from that. Carroll’s strength is never in the weirdnesses, although every one of his books contains a major element of the fantastic. Instead, Carroll’s best writing centers around those integral and important details that make up characters and relationships. I consider the first third of Bones of the Moon to be the best love story I’ve ever read and think it would have not been out of place had it appeared inThe New Yorker. There’s no fantasy anywhere in it, either, except the wonder that such a love could ever grow between two people. In White Apples, the reader never gets to see those important details between Vincent and Isabelle, and must instead learn about their character and relationship from the things they tell each other and awkward flackback sequences. In the world of creative writing workshops, we would consider this “telling, and not showing,” except that Carroll’s an accomplished storyteller and doesn’t linger on the telling for that long. If this is your first taste of Carroll, you might not even notice it, but for those fans, it provides enough of a twist to the tale that it is every bit as off-putting as the Twilight Zone cliffhangers at the end of each chapter here. I don’t want to give the impression that I didn’t like this book. I read it with the same fervor that I reserve for only a few authors (Carroll, Pat Cadigan, Iain Banks, and, recently, J.K. Rowling). But something nagged at me constantly, and I think it was the assumption that the relationship between Vincent and Isabelle was love, beautiful and strong. My suspension of disbelief didn’t have any trouble with Vincent back from the dead, but I could never get over the precious way that Vincent and Isabelle reflected on their past. It was like listening to a couple baby-talk with each other thinking that you would hear their words as endearing and not sophomoric. This is supposedly the first book of a Joyce Cary-like trilogy, where this was from the viewpoint of the man, the next will be from the viewpoint of a woman, and the third from a child. Having heard Carroll read the first chapter of the new book during his recent U.S. tour, I’m already excited by it, and it should be interesting to see how well he gets into the female viewpoint–the sections in White Apples give us a just a taste of that. That first chapter is weirder than anything in this book, and perhaps that is what Carroll is heading to: a book that shows us normal is really the fantasy, the fantastic.